He has served as the CEO of Godfather's Pizza. In the 2004 Senate race he was endorsed by Rainbow PUSH's Southeastern Operations Director Joe Beasley. 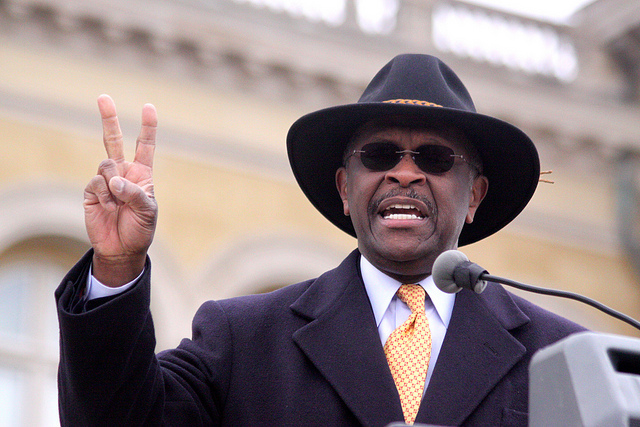 Herman Cain has identified himself with conservative causes. As a speaker, he articulates conservative values very well. Herman Cain has made the cause of civil rights a major issue. Herman Cain favors Federal Government intervention in the work place on the behalf of blacks and minorities. Republican U.S. Senate candidate Herman Cain issued a glowing statement commemorating the Civil Rights Act of 1964, read it on his web site. Herman Cain in his previous run for US Senator from Georgia, openly endorsed affirmative action on his web site. From WSB Debate Another area where Cain differed from his opponents was over the reauthorization of the Voting Rights Act and Affirmative Action. Both Collins and Isakson, feel the law should apply fairly to every state or should be abolished entirely. Cain, who has been endorsed by Rainbow/PUSH's Southeastern operations director Joe Beasley, stated he would vote for reauthorization of the Voting Rights Act. Rainbow/PUSH is known by its executive Jessie Jackson. Herman Cain and at Cain's web site. Republican presidential candidate Herman Cain said Tuesday that he is open to hiring gay staffers if elected president. “Nope, not at all. I wouldn’t have a problem with that at all,” he said in response to a question concerning whether he is willing to hire staff with diverse backgrounds. “I just want people who – I want qualified,” Mr. Cain added. “I want them to basically believe in the Constitution of the United States of America, so, yep, I don’t have a problem with appointing an openly gay person.” Herman Cain: I’d hire an openly gay staffer. The former Godfather’s CEO faced criticism earlier this year when he said he was reluctant to hire practicing Muslims. “I would have to have people totally committed to the Declaration of Independence and the Constitution of this United States. And many of the Muslims, they are not totally dedicated to this country. They are not dedicated to our Constitution. Many of them are trying to force Sharia law on the people of this country,” Mr. Cain said at the time. The Georgia Republican’s latest comment comes as he continues to rise in the polls. In his U.S. Senate race in Georgia Cain was only able to receive 26 percent of the vote and lost overwhelmingly to current Sen. Johnny Isakson. However Cain is certainly a survivor. In 2006 he was diagnosed with stage 4 cancer in his colon and liver. After long bouts with chemotherapy over the past few years, he has declared that he is cancer free. What Cain may have trouble as he considers his run for president is his previous support for affirmative action (which the conservative base rarely supports) and his view on taxes (which may be a little too conservative for Independent voters). Collins says Cain, the former CEO of Godfather's Pizza, is moderate too, but he has declined to elaborate on that until closer to the campaign. His campaign last week floated a charge that Cain had once supported race-based quotas for college admissions, citing an Atlanta Journal-Constitution article from last August in which Cain said he believed in affirmative action but not "one-size-fits-all applications." The article doesn't say Cain supported quotas, and his campaign insists he never has. He supports the return to the gold standard as the basis of the dollar but does not feel there is a need for an audit of the Federal Reserve. a sober look at Cain’s statements tonight and his past record show little to be enthused about. He stands diametrically opposed the fundamental positions of pro-liberty candidates like Ron Paul. Cain is pro-war and appears to be pro-Empire, against a Federal Reserve audit, and has been supportive and apologetic about the bailout. Free market is incompatible with crony capitalism and Fed intervention. Cain is pro-war and appears to be pro-Empire, against a Federal Reserve audit. Herman Cain, former Chairman and Member of the Board of Directors for the Federal Reserve Bank of Kansas City, flippantly denies the need to Audit the Federal Reserve while hosting the Neil Boortz Radio Show on 12/29/10 And, oh yeah, he’s a former chairman (1995-96) and deputy chairman (1992-94) of the Federal Reserve Bank of Kansas City. Herman Cain, former Chairman and Member of the Board of Directors for the Federal Reserve Bank of Kansas City, flippantly denies the need to Audit the Federal Reserve while hosting the Neil Boortz Radio Show on 12/29/10. He backed the Wall Street bailout, or according to Cain, the “recovery plan,” as he called it on his radio show. Cain wrote that nationalizing banks “is not a bad thing.” He even went as far as criticizing opponents of the bailout, calling them, free market purists, and absurdly claiming that no valid criticism had been brought forward. In his U.S. Senate race in Georgia Cain was only able to receive 26 percent of the vote and lost overwhelmingly to current Sen. Johnny Isakson. However Cain is certainly a survivor. In 2006 he was diagnosed with stage 4 cancer in his colon and liver. After long bouts with chemotherapy over the past few years, he has declared that he is cancer free. What Cain may have trouble as he considers his run for president is his previous support for affirmative action (which the conservative base rarely supports) and his view on taxes (which may be a little too conservative for Independent voters). Not conservative on the Federal Reserve Audit. Congressman Mac Collins of Georgia says Cain, the former CEO of Godfather's Pizza, is moderate too. His campaign last week floated a charge that Cain had once supported race-based quotas for college admissions, citing an Atlanta Journal-Constitution article from last August in which Cain said he believed in affirmative action but not "one-size-fits-all applications." In the 2004 Senate race Cain was endorsed by Rainbow PUSH's Southeastern Operations Director Joe Beasley. Cain articulates conservative values very well, as well as his position on civil rights. Herman Cain has made the cause of civil rights a major issue. Herman Cain favors Federal Government intervention in the work place on the behalf of blacks and minorities. Republican U.S. Senate candidate Herman Cain issued a glowing statement commemorating the Civil Rights Act of 1964, which was posted on his web site when he ran for US Senate.